Eriodictyon crassifolium is a medium sized open shrub, often growing 4-8 feet tall. In the garden the plants often cast off much of the length of a flowering branch after the blooming is complete and regrow from the center of the plant. Eriodictyon crassifolium will look better for a significant pruning after blooming. Felt leaved Yerba Santa grows in full sun on a variety of soil types and is a good plant for stabilizing slopes in a dry garden. 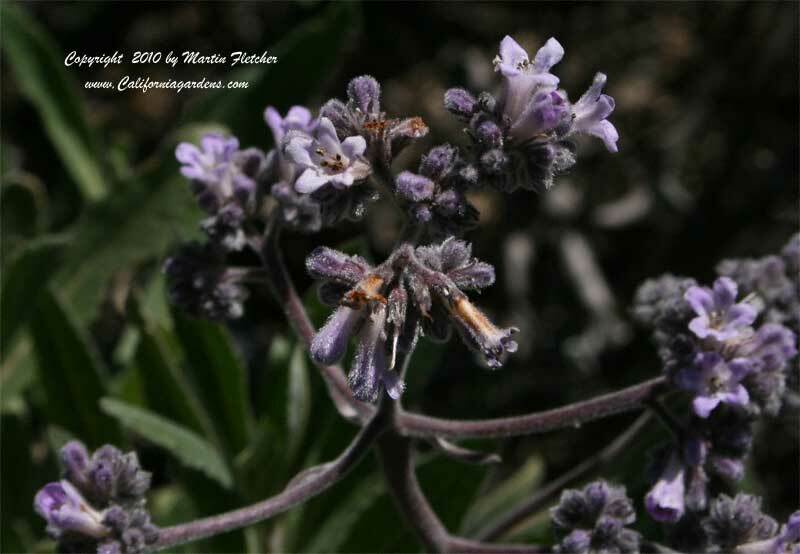 Eriodictyon produces lavender blue flowers in the Spring and Summer. Eriodictyon crassifolium is great for the butterfly garden and is good for attracting the Buckeye, Swallowtails, and Checkerspots. Eriodictyon crassifolium is Winter hardy to the mid teens. Blue flowers of Eriodictyon crassifolium - Felt Leaved Yerba Santa. High resolution photos are part of our garden image collection.